There are times when the sheer weight of all the available food options becomes overwhelming. Last week, I was sick and went on a bit of congee and brown rice bender in order to regain a sense of balance. 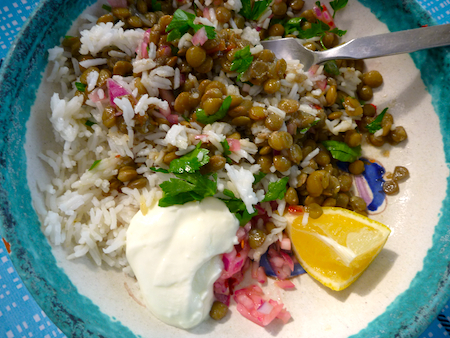 Then I made this simple lentils and rice with red onion salad and ate it three nights in a row and I felt all the better for it. With all the festive food being planned and prepared in the lead up to Christmas, there are times when I have enough of obsessing about food and all I really want to eat is simple food like this Peruvian lentils and rice dish. I’m a bit of a greens obsessive but I couldn’t even be bothered making a salad or cooking some greens. I just chopped up some herbs, added a dollop of yoghurt and that was that – a nutritionally complete meal that was completely delicious and incredibly satisfying. 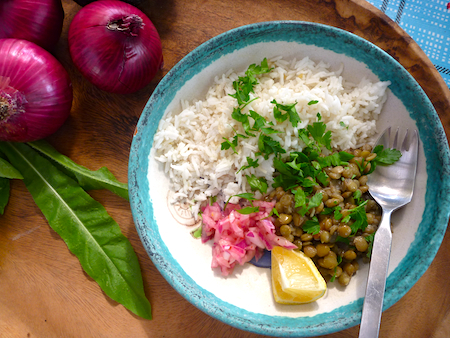 The thing that lifts the lentils out of the ordinary is the marinated red onion salad and the rice: salted and sauteed in olive oil and garlic. You can, of course, add sides to this and make a more elaborate meal but, sometimes, particularly with excesses of Christmas descending upon us, the simple things are more than enough. Rinse onion, then cover with water, add a teaspoon of salt and let soak for about half an hour. Drain and rinse soaked onion. Dress with lemon, chilli, a dash of olive oil, and salt and pepper to taste. Let marinate for about an hour (or even overnight is good) to let the flavours mingle. Rinse lentils and remove any dirt. Place in saucepan cover with water and bring to a boil on high heat. Drain and place back in saucepan with about 3 cups of water and salt. Bring to a boil lower heat and simmer uncovered for about 20 minutes. Meanwhile, saute onion and garlic in olive oil until golden. Add tomato and cook until tomato has melted, and the liquid evaporated. Remove from heat and add to lentils after they have simmered for about 20 minutes. Simmer lentils with tomato mix for about another 10 minutes until the flavours have mingled and the lentils are cooked but not mushy. If the lentils dry out too much, add a bit more hot water. Rinse and drain rice. Heat about one tablespoon of olive oil in a pan and saute garlic for about 30 seconds. Add rice and salt saute for about a minute. Add water to about 3 cm (1 inch) above the rice, bring to the boil and simmer uncovered for about 3–4 minutes until most of the water has evaporated and some holes appear on the surface. Sprinkle with ½ tablespoon of olive oil, cover, turn heat down low and cook for 15 minutes until rice is cooked and dry. Fluff rice, then cover and let sit for about ten minutes before serving. 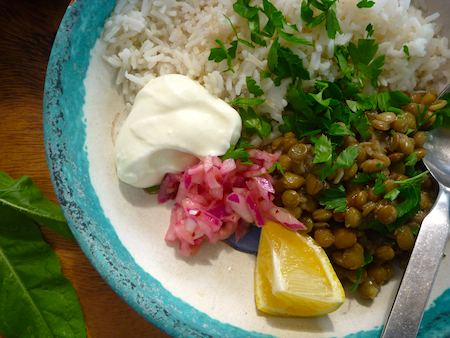 Serve rice on plates with lentils, a small pile of onion salad and a dollop of yoghurt on the side. This looks so good, Elizabeth! Such enticing colourful photos, too. Come cook in Norway! But can’t guarantee that you’ll find all ingredients you’ll need, here. I’d love to come to Norway, it is true that we are spoilt in Australia with a long growing season so we have lots of produce all year round. I love Scandinavian food, though I would miss my veggies in the winter. I feel like a bit of a treacherous fibber clicking “like” to this as I HATE green/brown lentils. I hate them unless they are completely turned to mush in dhal but this recipe is going to get made and sampled. I really REALLY hope that they exceed my expectations ;). If not, it’s back to the red lentils methinks. You could perhaps try it with the Puy lentils. I like brown/green lentils for a change and there are some things like Greek lentil soup where they are absolutely essential. I love lentil soup because they break down but when they are whole their texture doesn’t appeal to me, same goes for puy lentils to be honest. I guess we all have things that we just don’t like and lentils are one of my bugbears.